There’s so many ways to cook tofu, this is one of the easiest and most delicious. The otherwise bland tofu is topped with tasty fried shrimps and shallots mixture. It is then seasoned with soy sauce and sprinkled with spring onions. When I was just a little girl, my mother would cajole me to eat tofu by telling me that my skin would be as fair and smooth. I didn’t need much convincing for this particular dish. Since living on my own, this is one of my favourite dish to make as it is fast, easy and healthy. 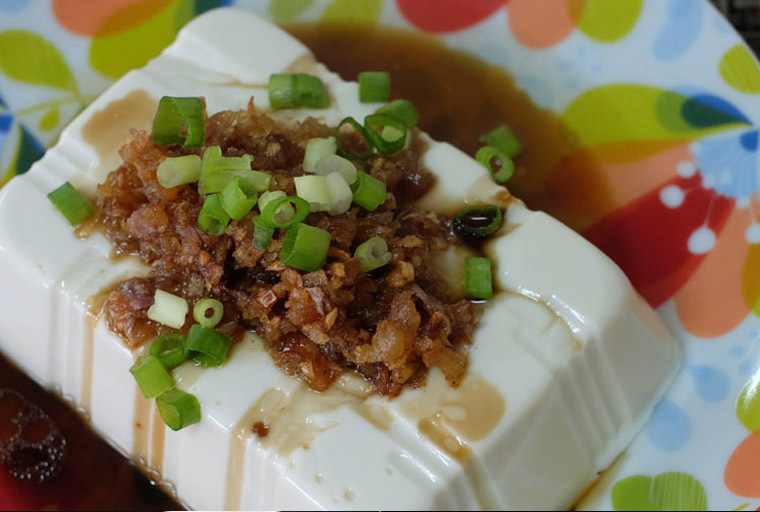 This dish especially delectable with homemade tofu, normally only available at the wet market. In my effort to eat less meat, I often eat plant protein such as tofu and dhal. The former is rich with protein and contains little calorie and fat. Step 1 TO COOK: In a wok of boiling water, put a plate of tofu on the steam rack and cover it with a lid. Let it steam for about 10 minutes. Meanwhile, fry dried shrimps and shallots in oil until they turn brown and aromatic. It should take about 5 minutes. Set aside. Step 2 TO SERVE: Pour shrimps and shallot mixture onto the cooked tofu. Top it with soy sauce and spring onions. Steam tofu (10 min). Fry 2 tbsp chopped shallots and 2 tbsp chopped dried shrimps (5 min), then pour over steamed tofu. Drizzle with soy sauce & garnish with chopped spring onions. COOKING TIPS: How to cook faster? Put steam tofu in a metal plate when steaming. It cooks quicker as metal conduct heat faster. As it takes a long time to boil water over the stove, I like to use the electrical water boiler and pour boiling water into the wok. Instead of steaming it on a stove, you can place it in on top of almost cooked rice in the rice cooker. 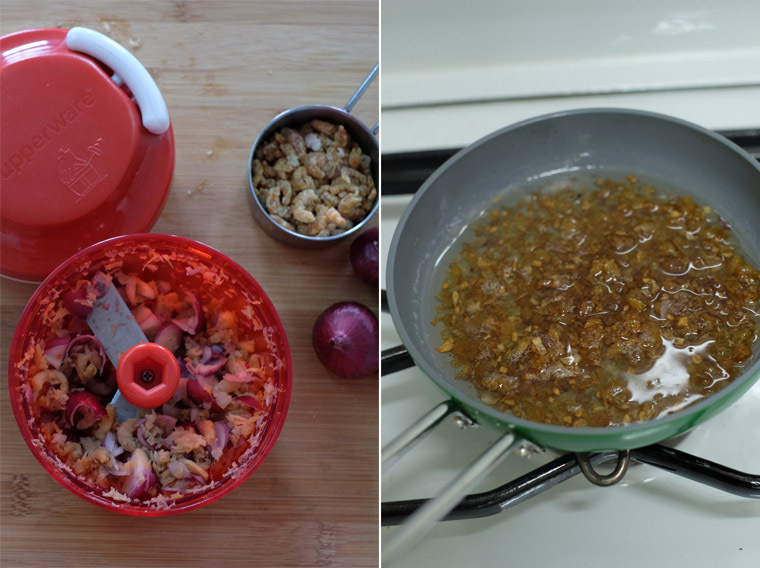 I use a manual chopper to chop the shallots and dried shrimps, and then fry them in an egg pan.